H. Nikaido and J.A. Hall, Overview of Bacterial ABC Transporters. J.A. Hall, A.L. Davidson, and H. Nikaido, Preparation and Reconstitution of Membrane-Associated Maltose Transporter Complex of Escherichia coli. C.H. Panagiotidis and H.A. Shuman, Maltose Transport in Escherichia coli: Mutations That Uncouple ATP Hydrolysis from Transport. 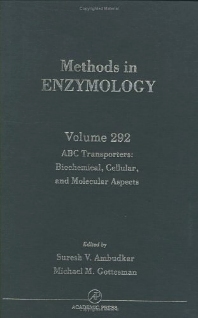 W. Boos, Binding Protein-Dependent ABC Transport System for Glycerol 3-Phosphate of Escherichia coli. F.Zhang, J.A. Sheps, and V. Ling, Structure-Function Analysis of Hemolysin B.
P. Delepelaire, Erwinia Metalloprotease Permease: Aspects of Secretion Pathway and Secretion Functions. M. Kuroda, H. Bhattacharjee, and B.P. Rosen, Arsenical Pumps in Prokaryotes and Eukaryotes. J.M. Croop, Evolutionary Relationships among ABC Transporters. R. Allikmets and M. Dean, Cloning of Novel ABC Transporter Genes. D. Taglicht and S. Michaelis, Saccharomyces cerevisiae ABC Proteins and Their Relevance to Human Health and Disease. R. Dudler and M. Sidler, Arabidopsis MDR Genes: Molecular Cloning and Protein Chemical Aspects. S. Volkman and D. Wirth, Functional Analysis of pfmdr1 Gene of Plasmodium falciparum. M. Ouellette, A. Haimeur, K. Grondin, D. Légaré, and B. Papadopoulou, Amplification of ABC Transporter Gene pgpA and of Other Heavy Metal Resistance Genes in Leishmania tarentolae and Their Study by Gene Transfection and Gene Disruption. G.L. Nijbroek and S. Michaelis, Functional Assay for Analysis of Yeast ste6 Mutants. G.D. Ewart and A.J. Howells, ABC Transporters Involved in Transport of Eye Pigment Precursors in Drosophila melanogaster. I.B. Roninson, D. Zuhn, A. Ruth, and D. de Graaf, Isolation of Altered Function Mutants and Genetic Supressor Elements of Multidrug Transporter P-Glycoprotein by Expression Selection from Retroviral Libraries. M.M. Gottesman, C. Cardarelli, S. Goldenberg, T. Licht, and I. Pastan, Selection and Maintenance of Multidrug-Resistant Cells. M. Naito and T. Tsuruo, Monoclonal Antibodies to P-Glycoprotein: Preparation and Applications to Basic and Clinical Research. W.R. Skach, Topology of P-Glycoproteins. J-T. Zhang, Use of Cell-Free System to Determine P-Glycoprotein Transmembrane Topology. A.R. Safa, Photoaffinity Labels for Characterizing Drug Interaction Sites of P-Glycoprotein. L.M. Greenberger, Identification of Drug Interaction Sites in P-Glycoprotein. S.Dey, M. Ramachandra, I. Pastan, M.M. Gottesman, and S.V. Ambudkar, Photoaffinity Labeling of Human P-Glycoprotein: Effect of Modular Interaction and ATP Hydrolysis on Substrate Binding. T.C. Chambers, Identification of Phosphorylation Sites in Human MDR1 P-Glycoprotein. J.S. Glavy, M. Wolfson, E. Neives, E.-K. Han, C.-P.H. Yang, S.B. Horwitz, and G.A. Orr, Identification of In Vivo Phosphorylation Sites for Basic-Directed Kinases in Murine mdr1b P-Glycoprotein by Combination of Mass Spectrometry and Site-Directed Mutagenesis. T.D. Bond, C.F. Higgins, and M.A. Valverde, P-Glycoprotein and Swelling-Activated Chloride Channels. E. Bibi, R.Edgar, and O. Béjà, Functional Expression of mdr and mdr-like cDNAs in Escherichia coli. S. Ruetz, Yeast Secretory Vesicle System for Expression and Functional Characterization of P-Glycoproteins. L. Beaudet, I.L. Urbatsch, and P. Gros, High Level Expression of Mouse Mdr3 P-Glycoprotein in Yeast Pichia pastoris and Characterization of ATPase Activity. L. Beaudet and P. Gros, Mutational Analysis of P-Glycoprotein in Yeast Saccaromyces cerevisiae. U.A. Germann, Baculovirus-Mediated Expression of Human Multidrug Resistance cDNA in Insect Cells and Functional Analysis of Recombinant P-Glycoprotein. M. Ramachandra, M.M. Gottesman, and I. Pastan, Recombinant Vaccinia Virus Vectors for Functional Expression of P-Glycoprotein in Mammalian Cells. C.A. Hrycyna, M. Ramachandra, I. Pastan, and M.M. Gottesman, Functional Expression of Human P-Glycoprotein from Plasmids Using a Vaccinia Virus-Bacteriophage T7 RNA Polymerase System. S. Zhang, Y. Sugimoto, T. Shoshani, I. Pastan, and M.M. Gottesman, A pHaMDR-DHFR Bicistronic Expression System for Mutational Analysis of P-Glycoprotein. T.W. Loo and D.M. Clarke, Mutational Analysis of Human P-Glycoprotein. S.V. Ambudkar, E.A. Lelong, J. Zhang, and C.O. Cardarelli, Purification and Reconstruction of Human P-Glycoprotein. S.V. Ambudkar, Drug-Stimulatable ATPase Activity in Crude Membranes of Human MDR1-Transfected Mammalian Cells. A.E. Senior, M.K. Al-Shawi, and I.L. Urbatsch, ATPase Activity of Chinese Hamster P-Glycoprotein. Y. Sugimoto, M.M. Gottesman, I. Pastan, and T. Tsuruo, Construction of MDR1 Vectors for Gene Therapy. M. Baudard, Construction of MDR1 Adeno-Associated Virus for Gene Therapy. C.G. Lee, I. Pastan, and M.M. Gottesman, Retroviral Transfer of the Human MDR 1 into Human T-Lymphocytes. G.L. Evans, Construction and Analysis of Multidrug Resistance Transgenic Mice. C.E. Grant, G. Bhardwaj, S.P.C. Cole, and R.G. Deeley, Cloning, Transfer, and Characterization of Multidrug Resistance Protein. D. Keppler, G. Jedlitschky, and I. Leier, Transport Function and Substrate Specificity of Multidrug Resistance Protein. X-B. Chang, N. Kartner, F.S. Seibert, A.A. Aleksandrov, A.W. Kloser, G.L. Kiser, and J.R. Riordan, Heterologous Expression Systems for Study of Cystic Fibrosis Transmembrane Conductance Regulator. N. Kartner and J.R. Riordan, Characterization of Polyclonal and Monoclonal Antibodies to Cystic Fibrosis Transmembrane Conductance Regulator. I.T. Crawford and P.C. Maloney, Identification of Cystic Fibrosis Transmembrane Conductance Regulator in Renal Endosomes. E.M. Schwiebert, M.E. Egan, and W.B. Guggino, Assays of Dynamics, Mechanisms, and Regulation of ATP Transport and Release: Implications for Study of ABC Transporter Function. Y.H. Ko and P.L. Pedersen, Overexpression, Purification, and Function of First Nucleotide Binding Fold of Cystic Fibrosis Transmembrane Conductance Regulator. S.A. King and E>J. Sorscher, Recombinant Synthesis of Cystic Fibrosis Transmembrane Conductance Regulator and Functional Nucleotide Binding Domains. S.H. Cheng, J. Marshall, R.K. Scheule, and A.E. Smith, Cationic Lipid Formulations for Intracellular Gene Delivery of Cystic Fibrosis Transmembrane Conductance Regulator to Airway Epithelia. T.R. Flotte and B.J. Carter, Adeno-Associated Virus Vectors for Gene Therapy of Cystic Fibrosis. Y. Wang, D.S. Guttoh, and M.J. Androlewicz, Peptide Transport Assay for TAP Function. N. Shani and D. Valle, Peroxisomal ABC Transporters. J. Leighton, Mitochondrial ABC Transporters. Biochemists, molecular biologists, physiologists, pharmacologists, geneticists, immunologists, and microbiologists. National Cancer Institute, National Institutes of Health, Bethesda, Maryland, U.S.A.